If you were told you could get $7 just to click an ad, it sounds very appealing, right? This is what the supposed PTC site Seven Dollar Click claims you can do on their site. But is Seven Dollar Click a scam or one of the highest paying PTC sites? I have joined to test and see if it can live up to its claims. Let me reveal right away that I am not impressed with what I found. In this Seven Dollar review, I will share all the details so you can see for yourself before joining. What is Seven Dollar Clicks and what does the site offer? If you have visited PaidFromSurveys.com before, you will know that I am usually not a big fan of sites that only offer PTC options (paid to click). They usually pay very low rewards and it takes a lot of patience to earn any real money on them. That is why I usually recommend get-paid-to sites (GPT) instead as they have higher paying opportunities like paid surveys, offers, micro-tasks, and more. However, when I saw 7 Dollar Click offering this much per click, I, of course, got curious and had to check it out. I was skeptical but decided to join to give it a chance and see what it really offers. The concept of Seven Dollar Click is quite simple – after you join, you can click a link. You then have to watch a certain website for 25 seconds, and you will then get $7. I tried to click a few times to see what happens. And as you can see in the image below, I actually got $21 into my Seven Dollar Click account after 3 clicks. You get money into your Seven Dollar Click account – but can you get them out? However, that I have $21 there does NOT mean that they will be easy to get out and the reason I stopped using it after having a look around is that I doubt I will ever be able to get them out. I cannot say this for sure, but I will in this review show you what I found, and then you can judge yourself if it will be worth the time for you. But please make sure to read the rest and check out the section with the red flags before you rush off to start clicking ads on the site. Then at least you will know the risks are if you decide to join. On any PTC, GPT, or survey site you join, it is important you know how you can get your money out before you start earning and spending time on the site. The payout option on Seven Dollar Click is, in my opinion, the first big red flag. You cannot get paid until you have earned $7,000. There is an extremely high payout threshold of $7,000. This means you will have to click 1000 ads before you can try to take your money out and see if it is real and if you will really get paid. I have never seen such a huge payout threshold on a PTC site before and that you have to wait this long to get paid is a big red flag and just not normal for sites like this. Usually, the payout threshold on PTC and GPT sites are somewhere between $1-$25. On a few, it is up to $50. But $7,000 is a ridiculously high threshold. In theory, you can then get paid through PayPal when you reach the threshold. However, you need to be aware that according to the terms, it will take 75 business days before you will get your money which is an extremely long processing time. Since a week can have maximum 5 business days, it will take at least 15 weeks (almost 4 months) to process the payments. This is ridiculous. And there are even more you need to know before deciding if it will be worth testing if you really will get the money. I was skeptical about the claims of Seven Dollars Click right away, as I have tested many sites that offer PTC options, and the claims it makes are just very unusual. After joining and having a close look around the site, I found several red flags that makes me even more skeptical and you need to know these red flags before you join. I have created a video that will give you an inside look so you can see the red flags for yourself. Below the video, you can read even more details and see even more red flags. In my opinion, you might end up wasting a lot of time if you do not know what you are getting into. If you have ever earned money on a PTC site by clicking ads before, you will know that $7 per click is an extremely high reward per click. In my opinion, it is just simply not a realistic reward to get for clicking an ad and watching it for 25 seconds on a site like this. Let’s compare it to one of the big PTC sites and what that offers per click. Usually, PTC sites pay A LOT less per click. The image above shows a couple of example of ads you can get paid to click on Scarlet Clicks. Here you will get $0.01 per click – and the image above shows some of the highest paying ads on that site. This is usually what you can expect when you click ads on PTC sites. What also makes it strange is when you then look at the price Seven Dollar Click charges its advertisers to advertise there. If this was then a very high price, then maybe that could explain how they supposedly can pay you $7 per click. 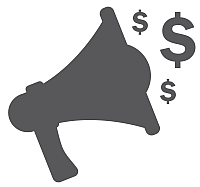 The advertising fees are not high so how can you get paid $7 per click? As the image above shows, advertisers pay $10 to get 1000 clicks. This means advertisers will pay $0.01 per click. So something seems off here, right? Another thing that is a huge red flag when it comes to Seven Dollar Click is the “proof” that it works. At the bottom of the website, there is a link to proof. If you click this, you are taken to their Twitter profile where you can see some video reviews from supposed members. One of the testimonials of Seven Dollar Click. There are not very many and they are posted very rarely. The above image shows the newest testimonial when I visited the site. I did an image search for this woman as I thought the testimonial sounded strange. Her picture came up in connection to selling video testimonials on the freelance portal fiverr. The same woman has sold testimonials on a freelance platform. The above just shows a couple of the images I found from fiverr. It seems her profile do no longer exist on the platform, but the images are still out there and reveal Seven Dollar Click has hired people to do testimonials. This is a big deal breaker for me. If it really worked, it should not be a problem to get real users to give testimonials. So a big red flag to consider before you start clicking ads and spending time on Seven Dollar Click. The way PTC sites usually work is that advertisers are willing to pay for clicks on their ads to get their website in front of people. They will, of course, only pay if they are sure that people will actually be on the website for the time they have paid for. That is why PTC sites usually have a number of seconds you have to be on the site to earn your reward. If you leave the site before this time, it will not count. This is not the case on Seven Dollar Clicks. You can click an ad and then change to another window and do other things on your computer and then go back and click the captcha once the 25 seconds have passed. It does not make sense to have it this way. If it is just because they have a poor system, this is definitely something that should stop you from advertising on the platform if you at some point would consider this. Now it is getting even more silly, in my opinion. Not only do you have to wait until you have earned $7,000 to get a payout. You can only get a payout if you get a paid membership. You cannot get your money until you have paid for a membership. This is unheard if. Yes, there are some PTC sites where you can pay to get a membership upgrade, but I have never before seen a site where you cannot get a payout until after you have paid. In addition to this, the membership options are very expensive. The memberships are quite expensive. 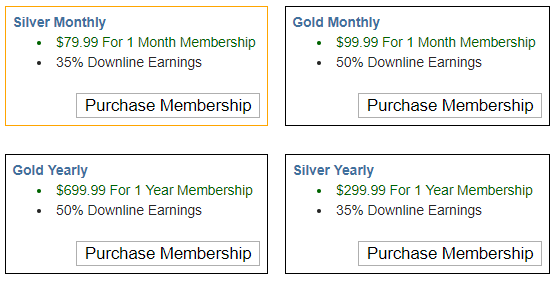 You can get either a bronze, silver, or gold membership. The difference is that the higher the membership you have, the higher commissions you will get for people you refer to the site. A gold membership will give you 50% commissions from people you refer. It does, however, cost $99.99 per month, or you can get a year for $699.99. This is a very high price for a site like this, and that they require you to pay to be able to get a payout is a huge deal breaker, in my opinion. I would NOT advise you to pay anything to a site that has this kind of demands. In addition to this, you have to remember that the processing time will also be around 4 months, so you cannot just pay for one month of a cheap membership and then get paid. This seems like an effective way to make sure you will be a paying member for a while. Not only do you have to pay to get a payout. You also cannot use your earning on Seven Dollar Click to pay for your membership. You cannot use your earnings to buy a membership. This means that you have to pay money upfront before you will know if you will ever get your earnings. On the popular PTC sites, you can always use your earning to upgrade to a higher membership. So this is another big red flag. I found something very concerning in the FAQ section on Seven Dollar Click. There are two questions that address why you might not get paid. It seems that it regularly happens members cannot get paid since it is in the FAQ section. All it here says is that if you cannot get paid or if you will be banned, it is because you have breached their terms. I then had a look at their terms and here I found something else that worries me. According to the terms, you will not necessarily know if you can get paid until you reach the payout threshold. According to the terms, if you reach $7,000 and are not able to get a payout, it is because you have breached the terms. From this, it seems that you will not necessarily be told if you breach the terms. You might breach the terms after just a few clicks, and then you can keep clicking and maybe you will even pay for a membership. Then suddenly you can find out you cannot get paid when you reach the threshold. So it seems you have no idea if you will be able to get paid once you reach the $7,000. I think it is very clear from this review that I am very skeptical about Seven Dollar Click. If it is a scam or not, I will leave up to you to judge. I have just presented what I found when I tested it, and why it is a site I will stay away from. But let’s finish by summing up the pros and cons of Seven Dollar Click, so you can get a better overview before making your decision. To me, Seven Dollar Click just has too many red flags. After having taken a close look at it, it is a site I will stay far away from. I will strongly encourage you to be very careful about joining and if you decide to invest any time or money on the platform, do not invest your last money. If you want to earn some extra cash online by doing tasks, clicking ads, taking surveys, etc. I would instead recommend you to check out the best GPT sites. All of these are 100% free to join. If you want to make the kind of money Seven Dollar Click promises, GPT and survey sites will, however, not be the way to go, as they will not make you rich. Then you should instead look into creating a full-time income online. Just be aware that no matter what, you should, in my experience, NOT expect to be able to earn huge amounts of money online with minimal effort and just by clicking a few ads. So be careful about any site that claims this is possible. If you have any comments, questions, or have any experiences with Seven Dollar Click yourself, I would love to hear from you in a comment below. In my opinion, Seven Dollar Click has way too many red flags to be worth the risk. You do not know if you can get paid until you reach $7,000, you have to pay to get a payout, and the site uses false testimonials to prove it works. Overall definitely NOT a site I recommend.